Amaretto celebrated Cinco De Mayo with the release of the 2017 Cinco De Mayo – El Primer Caballero! You can get the 2017 Cinco De Mayo – El Primer Caballero from May 1st to May 15th 2017 at all Amaretto Ranch locations! 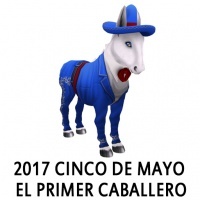 If you breed your 2017 Cinco De Mayo – El Primer Caballero with any horse you had a chance to get a White Mule!! 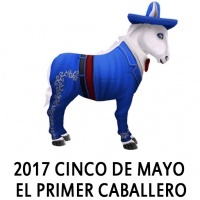 The Coat on the 2017 Cinco De Mayo – El Primer Caballero Horse horses DO NOT pass. The Eyes on the 2017 Cinco De Mayo – El Primer Caballero Horse DOES have the ability to pass! This page was last edited on 17 May 2017, at 22:04.